If you can play any musical instrument, or sing, you can be part of Mike Sweeney's Band! 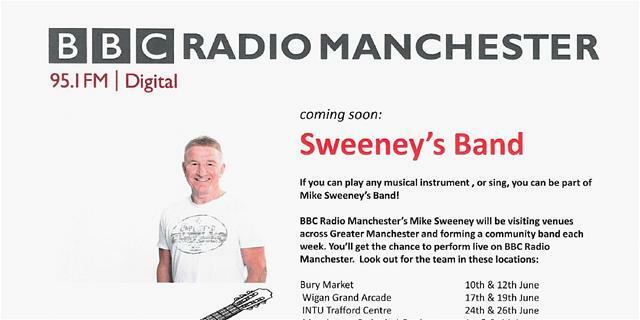 BBC Radio Manchester's Mike Sweeney will be visiting the award-winning Bury Market on Wednesday 10 June and Friday 12 June - giving people the chance to perform live on the radio. The plan is to form a "community" band to perform and sing a song (led by Mike) on Friday of that week. A musician, Clare Mooney, will help bring together the various musicians and singers for the final performance: these can be amateurs as well as local musicians, and it's open to anyone. All you need to do is turn up at Bury Market on either day between 9am and mid-day with your voice or your instrument tuned, ready to be part of this summer band!